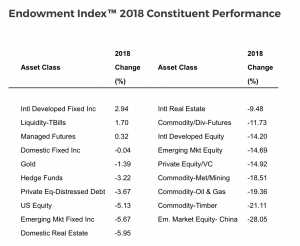 The Endowment Index calculated by Nasdaq OMX fell 9.09% for the year ended Dec. 31, compared to a 4.38% drop in the S&P 500 for the same period, and a 17.6% gain for the index in 2017. For the fourth quarter, the index tumbled 10.22%, compared to a 13.52% decline in the S&P 500. The down year was attributed to the confluence of a slew of negative factors, such as a stronger US dollar, which weighed down international and emerging markets during the second half of the year; global recession fears, US Federal Reserve rate hikes, higher interest rates, a slowdown in corporate profits, and an escalation in the US-China trade dispute. The year had started out looking like a continuation of 2017, with strong gains and low volatility as the index rose 5.51% through Jan. 26. However, concerns over rising US interest rates and a US-China trade war led to a correction in global markets that saw the index close out the first quarter relatively flat. The index edged lower for the second quarter, before rebounding slightly to end the third quarter up 2.04%. However, slumping markets in the fourth quarter helped the index end the year in the red. Only three of the index’s 19 components posted gains in 2018 as international developed fixed income returned 2.94%, US T-Bills gained 1.70%, and managed futures rose 0.32%. Meanwhile, eight of the index’s components posted double-digit losses for the year, led by emerging markets-China, which plunged 28.05%, commodities-timber, which fell 21.11%, and commodities oil & gas, which ended the year down 19.36%. The index is based on the portfolio allocations of more than 800 educational institutions managing over $500 billion in total assets. Each of the 19 sub-indexes that comprise the index are investable, with more than 30,000 underlying securities within those sub-indexes. The current target allocation is 52% alternatives, 36% equity, 8% fixed income, and 4% liquidity.